If I had to pick one dish as the most uniquely Slovak, it would have to be bryndzové halušky. Halušky are potato dumplings, and they come in many varieties. They can be topped with cabbage, eggs, or simply used as a side dish. But when you mix them with bryndza, a soft crumbly cheese traditionally made by shepherds out of sheep milk, you get this national dish. Of course, to make them right, you will need bryndza. It’s not very easy to find in the United States. I ordered mine online, from a place called Slovak-Czech Varieties. In the recipe below, I mixed the bryndza with sour cream to make it bit more smooth. You may want to avoid this step, or use less cream. For another set of pictures showing how to make halušky, visit the link to a newer post. 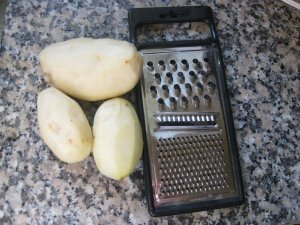 Start by peeling and shredding potatoes (zemiaky). 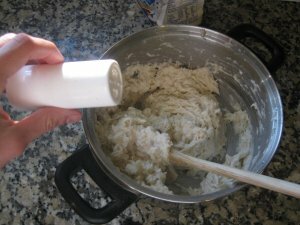 Drain the liquid and stir in about the amount of potatoes in flour. Add salt. 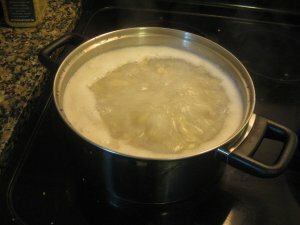 Then use a kitchen knife and a cutting board to toss pieces about an inch long into a large pot of salted, boiling water. Let cook for few minutes. 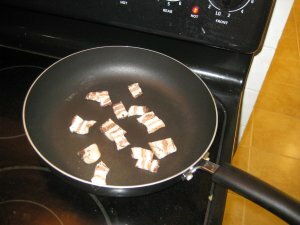 In the mean time, cut bacon into small squares and fry them to make “škvarky”. Strain the dumplings. Use a wooden spoon to clear off the goo that clogs up the holes. Take your bryndza and stir it in. Top with bacon and few spoonfuls of grease. They also taste great topped with with shredded “oštiepok” cheese. 82 comments - What do you think? You should try to put at least one tsp of baking soda(our soda bicarbona)into potatoes mix. This food is very heavy and soda helps your stomach to digest this food much better. It doesn’t change taste of it. Thanks for the tip! I’ll try that next time I make halusky. Baking soda will actually produce the contrary effect: it is alkaline, so it neutralizes your stomach acids (of course only in the measure of the amount you use and the strength of the alkali). This does not mean that using baking soda in your halusky will not make it “feel” lighter. So go ahead and use it at wish. If you eat too much of anything, it will be heavy in your stomach. Nedajte velka masti ani slaninky, aj bryndza je tazka do zaludka. Jedzte menej. Dobru chut! Halusky seems to be the same as Hungarian strapachka. Are you familiar with that dish? I heard of that dish, but I am not quite sure what’s in it. Let me look into this. But… the word strapachka (actually strapačka) is of Slovak origin. It would loosely mean something that’s really disheveled or shaggy. If a guy is “strapatý”, then his hair is messy. Thanks for the note! Strapachka is how we Hungarians call Slovak Bryndzove Halusky :)The name derived from Slovaks around Bekescsaba (Hungary). They are called ‘strapacky’ because by adding graded potatoes, they do not have smooth texture, thus are ‘strapate’- disheveled. Delicious nevertheless. I just found Slovak sheep cheese ‘bryndza’ and will make them soon. Dobru chut – Bone Appetite. My grandmother and great aunt used to make a similar dish they called “Trepankes” (close enough to the word “strapachka”). They were from Slovakia, about an hour out of Kocise, so a lot of their recipes used mixed slovak/hungarian names. I’m making a version of this for dinner today. My grandma’s recipe uses sour cream & cottage cheese instead of the bryndza and shred a small onion with the potatos. try to use feta cheese( the original from sheep milk), you need to put it in food mixer or mash it with fork first. you can add bit of soured cream or milk- and it works. 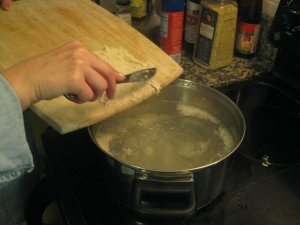 I thought these pictures were not the greatest, so I posted another recipe for halusky. That one shows you how to make just halusky, without any toppings. Halusky are very versatile. You can serve them with stews like chicken paprikash, or top them with bryndza, cabbage, or egg, and get a meal on its own. Does anyone know how much salt to add? 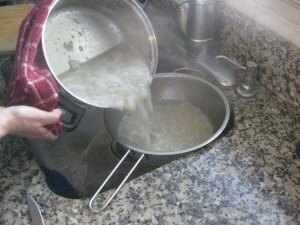 I don’t measure the salt precisely, but I add about 3 or 4 salt shaker “shakes” to the water in which I boil the dumplings. I also add about two “shakes” into the dough. I hope this helps! I’m Hungarian and I live in Hungary. The Hungarian sztrapacska is the same as bryndzove halusky. We use a very similar cheese for this dish, called “juhtúró” in Hungarian, but Slovakian bryndza is also available (mostly in larger supermarkets)in Hungary. “Strapačky” are known in my family as potato dumplings with stewed sauerkraut (sour cabbage?). Does your Granma know how to make “tarhoňa”? Your website has to be the etlecronic Swiss army knife for this topic. For bryndzove halusky I have found success with mixing feta with Philadelphia cream cheese (the lighter one- not fat free) and a little milk. My Grandmother was from Kocise and has passed on her recipie for halusky. It consists of the potato dumplings mixed with drained sauerkraut and fried bacon and onions. Ohhhh sooo very goood!!! Another version is the dumplings with browned butter and cottage cheese. Another yummy version. I suppose when my Novak family moved here in the mid 1920’s that is what they had here instead of the bryndza cheese. Tu dois visiter Toronto pour acheter bryndza! C’est disponible ici! great, congrat Lubos, you worked on it and you should be recognized! oops, I thought I was replying to a World Cup food, post, talking and about each country favorite food and linking halusky to this site. I think this is polish food. they do it with stale bread. I live around the corner from Slovak-Czech varieties and was able to grab some bryndza in order to make some bryndzové halušky. On the package, it notes that it should be combined 1:1 with cream cheese. When you mixed the bryndza with sour cream, did you do it separately and then add it to the halušky? Any suggestions for combining the cream cheese and bryndza as smoothly/easily as possible? And do you think this ratio is about right, or is there a better combination? Thanks for all of your help and for this amazing resource! Hey Adam, bryndza should not be combined with sour cream. My best guess why their package says that is that their bryndza is of export variety, and has been dehydrated somewhat so it keeps better. The sour cream is thus used to make it more creamy, and thus easier to mix with the halusky. The sour cream would also make the taste more mild. I would say, try adding the bryndza on its own. If it doesn’t melt sufficiently, or if the taste is too strong, then combine it first with sour cream and add it like that. Not sure if you have seen my note about the Trader Joe’s “imitation bryndza“, but when I buy that I don’t mix it with anything. The best tasting feta cheese, most similar to bryndza is imported Bulgarian feta sold in many US supermarkets. I do not mix it with anything. By letting it stand at room temperature in serving dish, the feta gets softer and creamier. Then I press it with fork and put hot halusky over feta and mix it. Unsliced bacon, cut in cubes and then fried makes a great topping. Maria, where do you buy unsliced bacon? I’ve been looking for it, unsuccessfully, for months. I suppose all central European specialty stores, deli with imports and specialty meat markets are worth to check. I buy it at Polish or Russian deli, where I ask to give me about a pound of smoked bacon in one piece. Kathy, what restaurant was this? I would love to try them like that. But as far as the bryndza goes, you are right, it’s the best to get it melted. What I do is I mix it in right after I take the halusky out and while they are still hot. Melted bryndza has a much better taste than when it’s “fresh”. It’s more creamy, like cream cheese. I make bryndzove halusky with greek sheep feta from italian store and unsliced bacon from german store. I am slovak and my boyfriend is canadian and he absolutely loves this food. Hi Lubos! Greetings again from Indiana. In the great Christian tradition in the Church it is now the Lenten Season. We abstain from meat on every Friday during lent. How about putting a pitch out on hear your Web site for some fans to send in NEW meatless meal recipes. Look forwarding Looking forward to Easter and from your reply. really the next best thing to bryndza is real feta cheese. I lived in slovakia for several years. Halusky refers to the potato dumpling noodle that is pushed through a sieve like pan into boiling water. 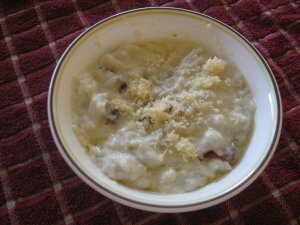 Bryndzova halusky is made with the bryndza cheese ( a slightly sharp, slightly drier, sheeps cheese) with sour cream, butter,and diced chopped bacon. Feta isn’t a bad outside option. Recipes vary but you get the idea. 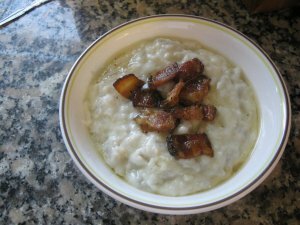 Strapacky is when the halusky are cooked with sauteed sauerkraut, onions, and bacon. Again there are variations but that’s the gist of it. Good hearty winter food. I live in US and use Bulgarian sheep cheese. It is much better than Greek feta. Sour cream is always good, I will try it. I never thought of dill, use that for gravlox, but why not. Sometimes I use small pieces of bacon in dumplings themselves, also chopped chives from garden. On another note does anybody make radishes with scallions and chicken fat? One of my favorite dishes. Me again. You can also use bone marrow in dumplings. Gives it a slightly different taste, but mnam. Lepší preklad pre halušky je z češtiny. Halušky sú po česky noky, v preklade gnocchi. Dumplings sú knedle rovnako v slovenčine aj v češtine. My grandmother was from what is now Henclova, Slovakia. She would boil 1/3 of the potatoes and grate the rest. She added flour and salt to the grated potatoes. 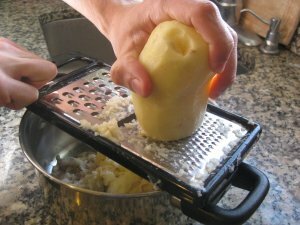 She didn’t drain the liquid from the grated potatoes. 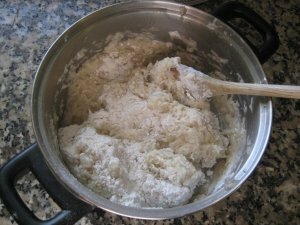 The dumpling like mix was scooped from a bowl with a spoon in small bits to the boiling water. I add a little oil to the water to keep from sticking to the bottom. After the last was scooped in it is boiled for 6 minutes and drained. 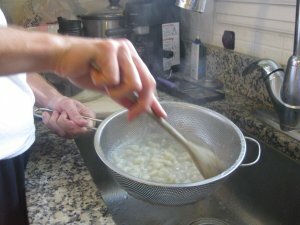 Then she would add mashed boiled potatoes, fried chopped green onion and diced bacon, the bacon grease with melted butter and half and half. It has always been a family favorite. Different family members would add their own extras like cottage cheese or sauerkraut. Needless to say we don’t eat this often as our lives are more sedentary than our grandparents. They lived on a farm without electric appliances. In 1997 I visited Henclova and saw the house my grandparents lived in before coming to America. Outside of a major shopping area in Bratislava I saw two men demonstrating the making of halusky. I sure never thought I would see that in my life. Jednotlivé recepty sa od seba líšia podľa toho, akú múku použijú alebo či dajú vajce. Vajce má funkciu pojiva. Joan, ja pochádzam zo Západného Slovenska a tu nie je tradícia miešať cestovinu s varenými zemiakmi. Halušky so zemiakmi je nejaký regionálny recept. Všeobecne známy na celom Slovensku je “granatiersky pochod”, to je cestovina nazývaná fliačky zmiešaná s varenými zemiakmi plus upražená cibuľa s červenou paprikou. yes. I don’t cook it (granatiersky pochod), for me it’s too much carbs in a meal, but my sister makes it back in Bratislava. It needs some good light side salat, cucumbers, etc. Thanks so much for this recipe and the others on the site. I love the photos – very helpful – and the expertise. I lived in Slovakia in Modra and then Spisska Stara Ves for a while and loved the traditional foods as much as I loved the Slovak people. I have been craving Bryndzové halušky for a while now! Thanks for helping me make them here in the US. I appreciate the effort made here, and I find the explanation of the method useful, but I find the complete lack of quantity measurements frustrating. I found a good recipe on wikibooks (https://secure.wikimedia.org/wikibooks/en/wiki/Cookbook:Bryndzov%C3%A9_halu%C5%A1ky) that actually uses bryndza (many recipes I’ve seen substitute some other cheese). I live near Toronto,Canada and Bryndza is available at an Eastern European store “Starsky”. 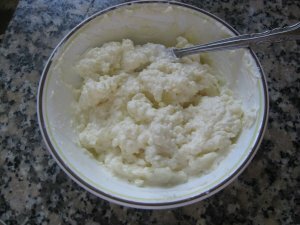 When I was growing up and my mother would make Halusky, she would use dry cottage cheese in them. She would make 2 kinds of halusky for dinner. One with the cheese, brown butter and bacon and the other with fried sauerkraut and brown butter and bacon. No plates on the table only a fork in hand and two large bowls on the table. Dig in. WOW delicious. We never could decide which combination was best. I make it now for myself, but only about once a year to bring back my own memories. Very heavy, but very very good. salt. Wonderful with the chicken drippings from baked chicken. MMMMMMMMMMMMMMMMMMgood. My Great Grandma who came to the US from Czechoslovakia in the 1910’s made Halusky for us but she used Wisconsin Brick Cheese instead of feta – much creamier! We still make it for our families and there’s nothing better (to me) than left-overs! Thanks for the helpful instructions and great step-by-step photos. Now I am ready to relive my memories of having Bryndzove halusky all over northern Slovakia! My wife (whose grandmother emigrated to Montana from Žakarovce in the early 20th Century) learned to make halušky in a very similar way. There were a few differences, but not many. 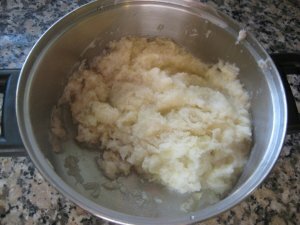 The main difference is that they would use potatoes that had been boiled and mashed, then mixed with egg and flour. She then rolls the dough out on a board, cuts it, and drops it into the boiling water. Bryndza cheese is not available, and she doesn’t like feta, so we use cottage cheese as a substitute. One day, I would like to make fresh farmer’s cheese and try that! Anyway, when the halušky floats to the top, she then drops them into a cast iron pan that has bacon and onions frying in it. Sometimes the pan also has cabbage. Evidently, she says that halušky is either with cabbage or with cheese (in our case, cottage cheese), but never both! 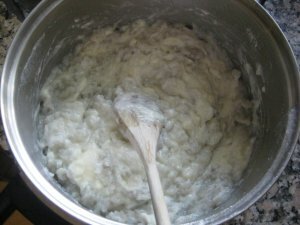 The funny aprt is that we usually use both anyway, stirring in the cottage cheese right at the end so that it just starts to melt into the halušky, bacon, onions and cabbage. The ebst aprts are the parts that brown and “almost burn” a little. Please forgive me if my translation of the title is wrong! huge appreciation goes out to Lubos for his efforts with this site. Thanks to him, my wife is trying new dishes from her ancestral land, and I am learning more and more about good, real food that always states great! Woah, a few typos up there ~ apologies! I am of Slovak heritage (both sets of grandparents came to the US from Slovakia), my grandmother on my mother’s side immigrated to the US from Stara Tura, and she only made her halusky with flour, eggs, salt and water. I never knew about using potatoes for the batter until I began going to Slovakia in 2002 to teach conversational English to children in Lucenec. This recipe is great, but do you cook the shredded potatoes first before adding the flour? no, don’t cook potatoes, just mix row shred potatoes with flour. I just made me halusky last night using original brynza I brought back from my recent trip. My grandmother made this recipe but used Swiss cheese. I can’t find any recipe that used Swiss cheese on the web, my family loved this dish. She was born in Austria. Has anyone else ever heard of using the Swiss cheese. It was really good. Went to Smrdaky in 1985 with my mom to visit her family. She took me to a restaurant by a lake that served Bryndzove Halushky. I fell in love with the dish and have been looking for a recipe ever since. It was my father’s (from Rajac) favorite dish. Thank you for posting this marvelous food. Great information from all of you. I was just in Bratislava and my cousin made Halushky with the special cheese I think and bacon. Love the noodles so have been looking for a pan with appropriate size holes as she took the dough and pressed it through the holes I think?? I want to try them and all this information from everyone is great. Thanks! My mother is second generation Slovak-American, and when I was a kid she’d often make egg noodles with cottage cheese. I thought that was just one of her quirks, but it’s probably a very Americanized descendant of this dish, right? Great site you have here but I was curious about if you knew of any user discussion forums that cover the same topics discussed here? I’d really like to be a part of group where I can get feedback from other experienced people that share the same interest. If you have any suggestions, please let me know. Many thanks! I am reasonably certain I will be told many new stuff right here! I am from Slovakia. Just found company on Internet, which carry many European ‘stuff’ among them Bryndza, Slovak sheep cheese, used in Bryndzove halusky. you would have to go on internet to find that special pan with holes, to press your dough into boiling water. It is round with handle and small holes (about 1cm in diameter) on the bottom. But before this pan was available in Slovakia, my Mom put this soft dough on small wooden board and with help of knife with great speed pushed halusky, one by one, into boiling water. I was never able to get that speed, but by that time, special pan was in stores. Maybe they will be able to help you find this special pan. Good luck.